Amazon, eBay and eBay’s book-selling platform, Half.com, are what most people think of when they want to sell their stuff, unwanted holiday gifts, books or other inventory. Unfortunately, each one of these platforms has been steadily increasing its seller fees over the years, to the point that many sellers can’t make enough of a profit to justify the time and energy spent on listing. Unfortunately, there is more than meets the eye when it comes down to just how much money you will eventually pay in the form of commissions. In addition to the 10% final value fee, you must also consider Paypal, which is the payment system that eBay now requires all sellers to use. With Paypal, you’ll be paying an additional 30 cents per transaction, plus a 2.9% fee on the amount transferred in from the buyer. Furthermore, that 2.9% is charged on the entire monetary amount -which could include a significant portion devoted to shipping costs. So, if you’re selling anything heavy, like a textbook, beware: You might just end up giving your merchandise away for free! 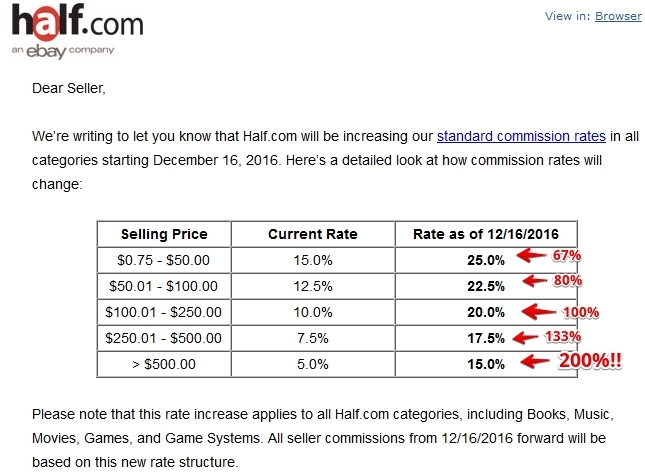 In the past, a safe(er) haven for sellers who wanted to sell big, bulky books was the Half.com platform. Here, you could list your books as long as you wanted. If something sold, you paid a more reasonable commission, and you also were reimbursed for shipping costs by the buyer. Well, Half.com must’ve realized that it could squeeze a lot more money from its sellers because I received the following email today. The bad news? Some fee tiers are about to increase by as much as 200%! Fortunately, other selling platforms have emerged in recent years. 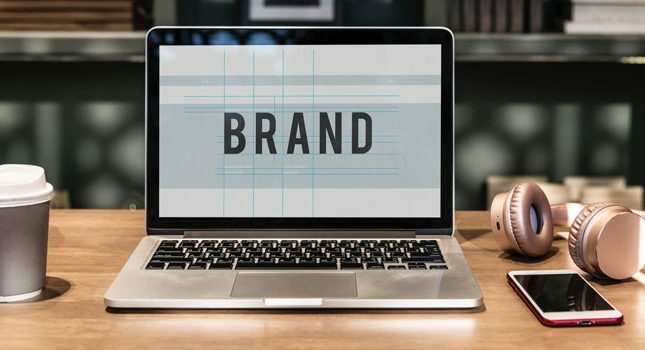 These alternate platforms are not as expensive to use as Amazon, eBay and Half.com, yet they offer many of the same key benefits. 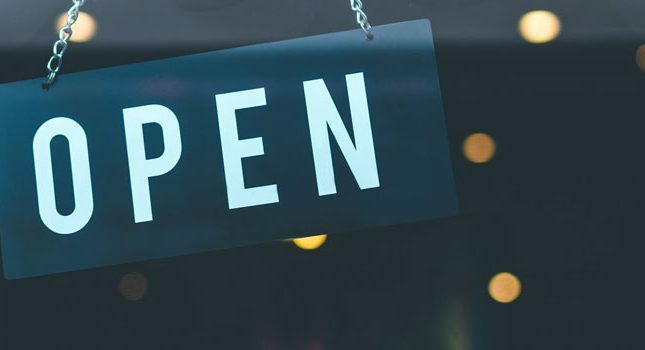 This well-known arts-and-crafts site charges listing and final value fees on its fixed-price listings; however, the fees are significantly lower than those of eBay and Amazon. With Etsy, you pay a 20 cent listing fee and just 3.5% on the final value of your sold item. Also, for the same price, your Etsy listings will run four times as long as those posted on eBay. Like Etsy, Bonanza offers sellers a platform where they can sell unique and quirky items at a fixed price, yet the items don’t necessarily need to be homemade or “crafty.” Also, the site also doesn’t charge any money for simply posting a listing. Once an item sells, Bonanza’s average fee per sale is as low as 3.5%. If you’re looking for an auction-style platform, give eBid a try. This easy-to-use, intuitive platform charges no listing fees whatsoever and asks for just 3% of your item’s final value. 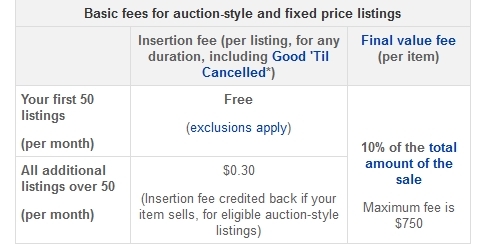 Best of all, if you’re looking to constantly sell items online, you can become an eBid “lifer” for just shy of $50. This site looks like eBay, but it isn’t. For starters, Ealtbay doesn’t charge sellers any money to list their products on the platform. The final value fee charged for all items, regardless of their tier, is just 1.60%. And finally, Ealtbay doesn’t force you to use only Paypal as your sole payment method. If you have bulky and/or heavy items to sell and wish to avoid exorbitant shipping costs, your best bet might be to list those items on Craigslist. This platform caters to local sellers who pay no money whatsoever for listing their items for sale. When those items do sell, these sellers don’t pay any final values either. In other words, Craigslist is completely free to use. This platform operates much like Craigslist but offers both the seller and buyer additional information about each party, ensuring a better sense of personal security. 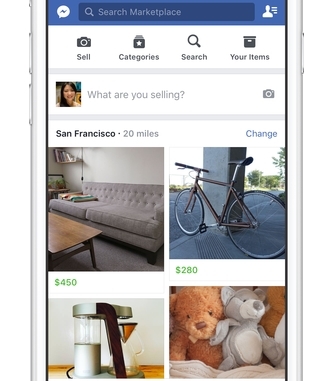 Like Craigslist, Facebook Marketplace is completely free to use. Most sales transactions and item pickups occur locally; however, you could potentially list your items in several geographic regions, then pay for shipping charges out of your own pocket. This neighborhood-based social network platform and app enables neighbors to message each other about area crime, curb freebies, school news, and items for sale. With Nextdoor, there are also no listing or final value fees. Best of all, you may already know a good majority of your buyers. This site started out as a place to buy and sell computers and software, but it has since expanded and now offers other product categories such as apparel, hardware, toys, jewelry, etc. The site has much of the same look and feel as Amazon but without the huge seller fees. Newegg features reasonable seller commissions ranging from 8% to 15%; these commissions include credit card processing fees. Perhaps best of all, Newegg offers an Amazon FBA-like service called Shipped by Newegg. 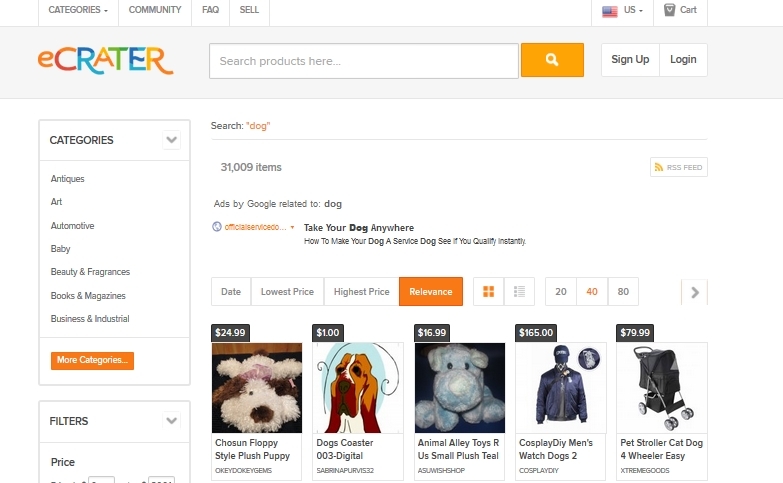 This platform operates very much like eBay and has been around since 2002. There are no listing fees with iOffer, and the final value fees range from 5-10%. If you have lots of items priced from $25-$100, this is a good site to use because you’ll pay only a 5% fee on sales. 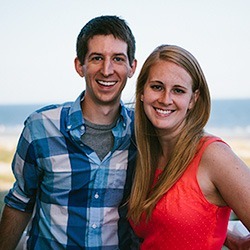 This online marketplace is not only free to use, it even offers a free online store builder. Sellers have the option of using Google Wallet at checkout and can also import their listings from eBay. As a seller, you don’t have to tolerate unreasonable seller fees and other required commissions from online marketplaces. Luckily, there are many other selling platforms out there that don’t gouge you for trying to make money by selling your items online.